Chemists in the US have created a water purifier that can remove organic toxins without the addition of acids or other harmful chemicals. The device, which uses two highly porous membranes to generate purifying hydroxyl radicals, could help to provide clean drinking water for the developed and developing world. Providing safe drinking water is one of the top priorities for scientists working on humanitarian projects, and one particular problem is the contamination of groundwater aquifers with toxic organic compounds. Even in the US, two-thirds of all hazardous waste sites are contaminated with trichloroethylene (TCE), which is potentially carcinogenic. TCE, together with 2,4,6-trichlorophenol (TCP) - once used as a pesticide and fungicide - is responsible for drinking-water contamination in much of the world. One way to remove organic compounds like TCE and TCP is the Fenton reaction. This uses a solution of hydrogen peroxide to oxidise an iron catalyst in solution, generating hydroxyl radicals which react with and degrade organic compounds. But this oxidation typically needs very acidic conditions and a lot of chemicals, which are both expensive and environmentally unsound. Now, Dibakar Bhattacharyya of the University of Kentucky in Lexington and colleagues have come up with a way to perform the Fenton reaction while minimising chemical usage. 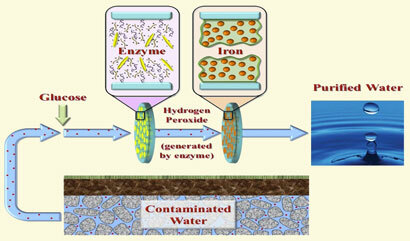 Their device has two highly porous, micro-filtration membranes. To purify water, they first add glucose, and then let the water pass through the first membrane where an enzyme converts the glucose to hydrogen peroxide. In the second membrane, the hydrogen peroxide encounters iron species trapped in a network of polyacrylic acid, where hydroxyl radicals can form. As the level of hydrogen peroxide in the filter can be controlled, and because the iron and acid is trapped in the membranes, Bhattacharyya's group say no additional chemicals need to be supplied. The researchers tested the device with a solution of TCP, and found that it destroyed all of the compound initially, but only 55-70 per cent after 30 minutes as the iron species in the membrane are oxidised. 'This device has the potential to remove a wide variety of organic impurities from water,' says Bhattacharyya. Benny Freeman, an expert in water purification at the University of Texas at Austin, US, thinks the lack of added acid, the general lack of other toxic chemicals and the use of inexpensive micro-filtration membranes all go in favour of the device. 'I do believe it is a significant step forward for the field,' he says. Bhattacharyya did not want to discuss potential applications for his group's device because of patent applications. However, he says they are planning to test a larger version with industry.